As well as supporting literacy, storytelling in schools provides a wonderful springboard for all kinds of outcomes, from global awareness to expanding empathy. It can also be a stimulus for continued creativity in the classroom, through art, creative writing, songwriting, even cooking. I am happy to collaborate with teachers to deliver whatever would suit their school best. I have worked with many primary schools, from Nursery to Year 6. See below for two examples of my work in schools. Over two weeks in June I introduced the whole school to The Pied Piper of Hamlin and led sessions on drama, storytelling and songwriting. 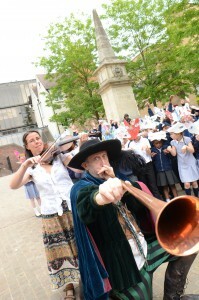 This culminated in an event at The Story Museum in Oxford, including a procession, with the children dressed as rats and Michael Rosen as the Pied Piper. This was funded by a donation from Maggie’s Day, a private trust. Reception: Too much Talk – a funny tale from Africa plus San San Croma, a singing game passing stones. A programme about spiders, making reference to Spiderman and other real life stories they had about spiders. In passing, we were able to talk about the slave trade (how the Anansi stories travelled from West Africa to the Carribean) and Native American culture. My fees for a full day’s performance in school are £300 plus travel at 40p a mile. Fees for other projects depend on the amount of preparation required, so please contact me to discuss your ideas.